With the JSE breadth narrowing sharply to being dominated by the moves of a handful of large-cap Rand hedges, it’s becoming increasingly difficult to hunt for good stock picks. If you remove Rand hedges, there is precious little left that is not suffering at the hands of the economy. If the two conditions above are met, then we have at least ONE year of uninterrupted dividend growth. So, requiring at least 5 years of sequential, uninterrupted growth necessitates the examination of the last 10 sets of known sequential financials, which can be a tedious task. In this exercise we also need to exclude REITS and Property stocks as these by definition are income plays that pay regular dividends. Fortunately, Sharenet Analytics clients can pull up this list at a press of a single button in their JSE Share Watchlist (JSW), which reveals a list 21 shares long, ranging from 18 to 5 years sequential, uninterrupted dividend growth. We have just shown the bottom 10 candidates below, with how long they have increasingly grown dividends shown by the "YRS" column. 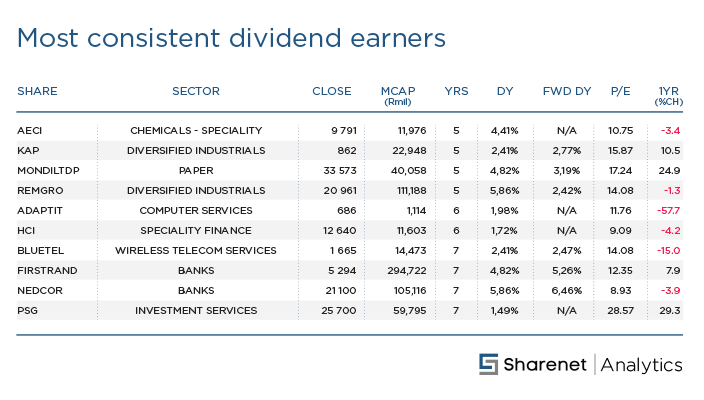 The historical dividend yield "DY", the forecasted dividend yield "FWD DY", the historical price-to-earnings ratio "P/E" and the growth over the last year of the share price "1YR %CH" is also shown. If you would like to see the full list including shares ranked 1-11, ranging from 18 to 8 years sequentially uninterrupted dividend growth, just give us a call on 021-700-4828 or 021-700-4838, regardless if you are a Sharenet client or not, to arrange to have the full PDF report sent to you. Sharenet Analytics clients can download the report from the Downloads > Market Commentary menu.